The moral level must have been very low. The folklore tells us that one famous character was a lady, Dorothy Matly, with the dubious reputation of being a 'curser, a liar, and a thief'. Hardly surprising then, when a young miner lost twopence it was she who came under suspicion. This she hotly denied, with a dramatic protestation that if she had taken the money the ground would open and swallow her up. The ground did open and the miner retrieved his money. 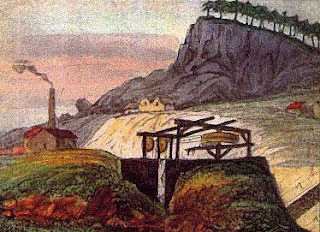 As the lead industry declined the people of the village sought employment in the quarries, the mills and on the railways.